News about writing and writing about the news. 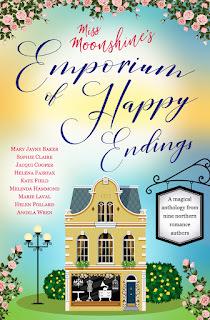 There's nothing better on these bright summer days than a happy ending, so I've chosen a very special book to review for my last blog post this summer: Miss Moonshine's Emporium of Happy Endings. 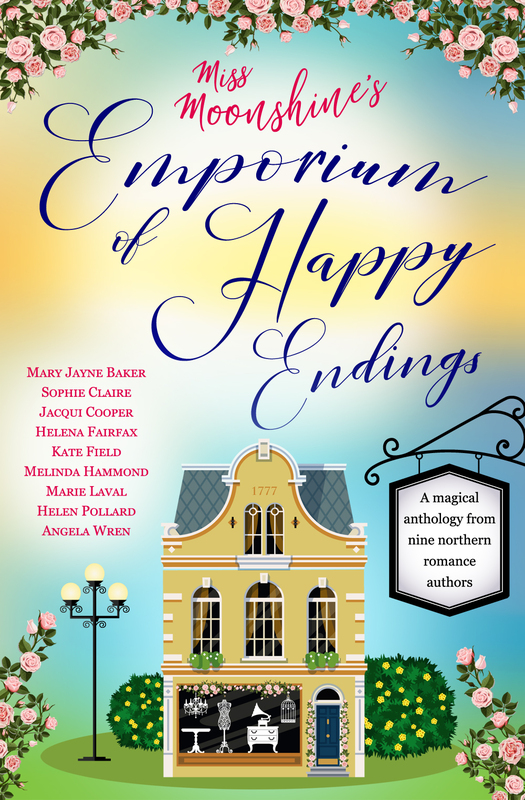 The idea came from Yorkshire author Helena Fairfax who, along with eight author friends, decided to write an anthology based loosely on the picturesque town of Hebden Bridge in the Calderdale Valley, where they regularly meet. The real triumph of this anthology is the way the authors have come together with one thought in mind - to seamlessly join their stories into an exceptionally good read, leaving the reader wondering what exactly is going to happen next. It's romantic escapism at its very best. So here are the authors, in alphabetical order. Sophie Claire writes emotional stories set in England and in sunny Provence, where she spent her summers as a child. Living on the edge of the Yorkshire moors, Jacqui Cooper doesn’t have to look far for inspiration for her writing. Her short stories regularly appear in popular women’s magazines, including Woman’s Weekly, The People’s Friend and Take a Break. Writing has always been her dream and she is thrilled to now be able to do it full time. Kate Field writes contemporary women’s fiction, mainly set in her favourite county of Lancashire, where she lives with her husband, daughter, and hyperactive cat. Melinda Hammond lives in the Pennines, where she weaves her stories full of romance and adventure. Since her first book was published by Robert Hale in 1983, she has had around 50 historical novels published. She won the Singletitles.com Reviewers' Award in 2005 for Dance for a Diamond and her novel Gentlemen in Question was a Historical Novel Society Editors' Choice in 2006. Writing as Sarah Mallory, she has won the prestigious RoNA Rose Award from the Romantic Novelists Association in 2012 and 2013. As a child, Helen Pollard had a vivid imagination fuelled by her love of reading, so she started to create her own stories in a notebook. She still prefers fictional worlds to real life, believes characterisation is the key to a successful book, and enjoys infusing her writing with humour and heart. 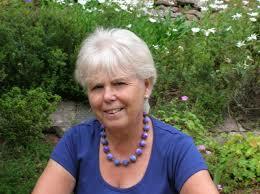 Helen is a member of the Romantic Novelists' Association and The Society of Authors. Angela Wren is an actor and director at a theatre in Yorkshire, UK. She loves stories, reading and writes the Jacques Forêt crime novels set in the Cévennes in south-central France. Her short stories vary between romance, memoir, mystery and historical. Angela has had two one-act plays recorded for local radio. A final note from me. After eight years, endless posts on every topic you can think of and tens of thousands of hits from all over the world, it's time for me to take a break. And what better place for me to do it than in the land of happy endings? Au revoir and thanks to everyone for your loyal support. A Guernsey girl living a long way from home. Success at 23 The Strand! 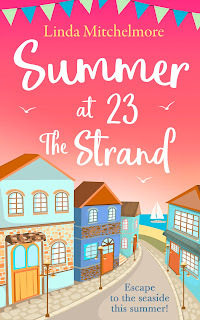 Success has arrived in spades this summer for Devon author Linda Mitchelmore whose latest book Summer at 23 The Strand - her first with HarperCollins Digital - is currently being read on beaches everywhere. Linda was one of the first people to encourage me when I was making the transition from journalism to fiction and her determination to overcome adversity is what makes her such a great ally. Today I have asked her along to answer some questions about her career to far. 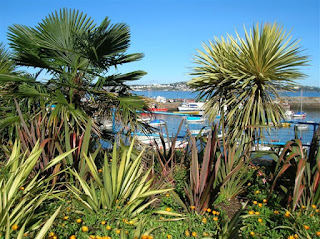 Paignton Harbour, a view enjoyed by each character in the book. Already a well established and successful author, your first book with HarperCollins, Summer at 23 The Strand, is flying high in the Amazon charts. How does that feel? I’m stunned, would be the honest answer. I admit to not being hugely ambitious and write because I want (have needed) to, so this is all a wonderful bonus. 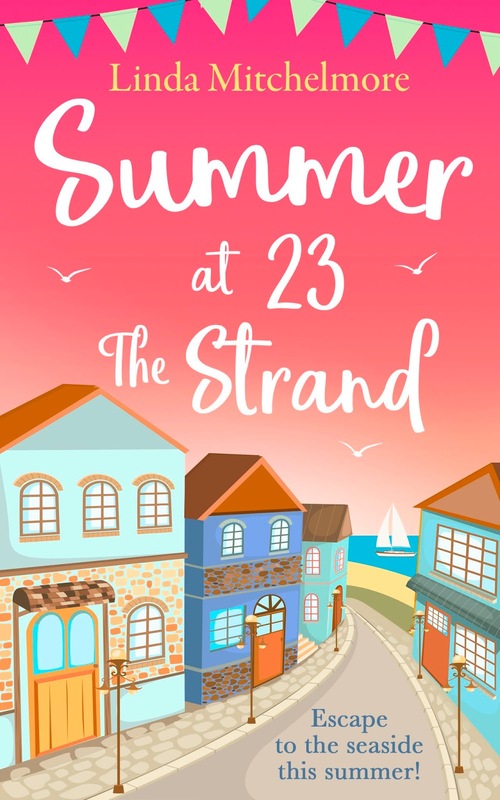 How has your writing routine changed since Summer at 23 The Strand was published? Another honest answer – there is so much PR to do/be part of that I’m actually doing a lot less, new creative writing at the moment. I don’t beat myself up about it though … I tell myself if it is writing-related then it counts as writing work! Your new book is a series of short stories linked together by a common theme – the beach chalet where all the characters spend their holidays. Where did the idea come from? We have a lot of beach huts around here. Huts are different from chalets (as 23 The Strand is) in that you can’t stop overnight and there is no electricity or water in them. When my children were small I used to share a beach hut with a friend, who owned hers, but the hut next door was a council-owned one and the tenants changed weekly or fortnightly. I was always fascinated by how different each lot of tenants were. Another prompt to write this book is the fact my mother cleaned holiday flats on Saturday mornings when I was younger and I used to help her when I was a teenager. Holidaymakers used to leave all sorts of stuff behind – clothes, shoes, books, jewellery, items of food – and my mother had to hand anything left behind to a supervisor, although it wasn’t unknown for her to slip something useful into her shopping bag! But one Saturday, there was a prettily-wrapped parcel on the kitchen table – ‘For the cleaner’. I don’t think I’ll ever forget the look of sheer pleasure on her face that someone had left her a present and not their unwanted items. So, two ideas that have been fairly deep-rooted over a few decades, is the answer. You have always been a prolific short story writer. Do you think a book like yours could aid the re-emergence of short stories in today’s magazines such as Woman and Woman’s Own? I’d like to think so, but the short story market is shrinking as we speak and the cynic in me thinks it probably won’t be long before all magazines are on line. I very much hope I’m wrong. Better news is that novels in the printed-on-paper form are making a very healthy comeback. You often say that you came to writing late in life. What advice would you give someone, young or not-so-young, keen to be published? Research the market you want to write for and then just get on with it! Which of your previous novels and novellas is your favourite? Gosh, that’s a bit like being asked to choose between my children. 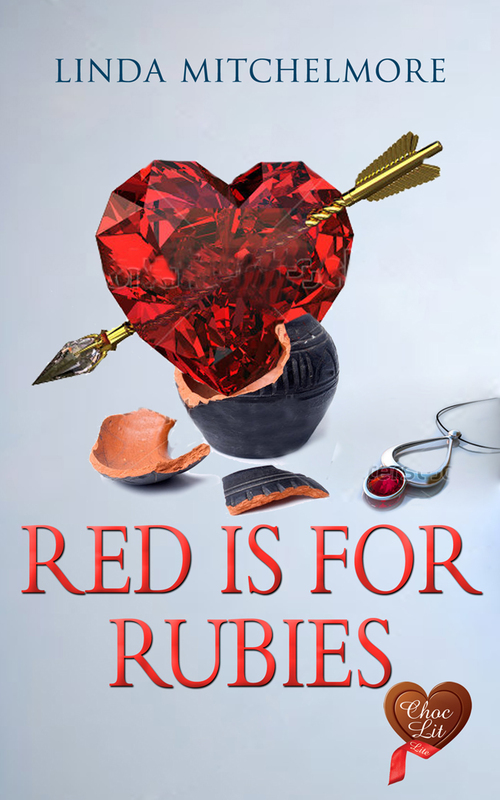 But to answer the question, Red is for Rubies (Choc Lit) is the book I would say comes from my soul- the characters I created and the emotions I put down on paper. It’s the book that’s done least well for me, which is a bit sad, but maybe now that Summer at 23 The Strand is doing so well readers will look to see what else I’ve had published and buy Red is for Rubies. All that said, the way Summer at 23 The Strand is doing right now it is fast becoming my new favourite! Tell us what your writing means to you and how your life would be without it. Writing for me was (and still is) a safety net when I lost my hearing due to viral damage. In the fictional worlds I create I – through my characters – can still hear. I have auditory memory and also, now, a cochlear implant which has restored a level of hearing for which I will be eternally grateful. Thank you Queen Elizabeth Hospital, Birmingham, and Claire and Gemma in particular. I doubt I would have become a writer if not for the immediate above, but it’s been a surprise, and delight, to discover writing is something I’m not half bad at. Is there any form of writing you haven’t tried yet but would like to in the future – e.g. scriptwriting? No, I don’t think so. I would have to learn that craft and, possibly, start on the bottom rung of the ladder and there would probably be a lot of rejections along the way before I found my way to the top. I’ve had quite enough rejections, thank you! Thank you for talking to me, Linda. If you could have one wish granted, personally or professionally, what would it be? Thank you for inviting me to chat to you, Marilyn. My one wish? Can I only have one? Okay, so here goes - the time, money, and staff to have fresh sheets on my bed every day! Linda was born and brought up in Devon, just a stone’s throw from the sea. She is still within walking distance of the house she lived in as a child and the hospital where she was born. A world traveller she is not and it’s rare to go into town and not see someone she knows with whom to stop and have a chat. Linda’s best subject at school was always English but becoming a writer never entered her head until she lost her hearing and decided to take a writing course for ‘something to do’ while the rest of her family watched TV or listened to music. She began with sending letters to magazines – the ones that gave monetary prizes or decent gifts like cameras and garden equipment and Schaeffer pens – mercenary little madam that she is! Short story submissions to magazines followed (she has had in excess of 300 short stories published, worldwide, now) and it seemed a natural step to have a bash at writing a novel, guided by her mentor who doesn’t wish to be named but who, for Linda, will always beummer at 23 The Strand is Linda’s seventh published novel. Linda does get dragged from her keyboard now and then to ride pillion on her husband’s vintage motorbikes (yes, plural – he has six), and walking (preferably near water) remains a joy and a regular occurrence – pub lunches at the end of said walks are always a draw. Family is very important to Linda and she now has two grandchildren, Alex and Emily, who are such a joy and huge fun – it seems easier watching grandchildren grow and develop than it did when she was a new and very inexperienced mum to her own children. There are also two adorable grand-dogs in the equation – Lola and Max – so family get-togethers are always rather full on with fun and noise! If she can find the time she might write a ‘family’ novel .... watch this space. As the temperature hit 29 degrees in London this week I recalled my very first heatwave. I was just two years old, travelling with my paternal grandmother from Guernsey to England across the English Channel, then on by train to the Midlands. Granny had lived through the bitter winters of the German Occupation of the Channel Islands so, despite the May sunshine, had dressed me for a trip to the Arctic Circle. Over my liberty bodice she added a blouse and warm woolly jumper, topped with a sturdy tweed jacket. Matching hand-made leggings that buttoned up the front (and wouldn't unbutton - I know because I tried) completed the outfit. I got hotter and hotter, gasping for air, and as I looked out of the window, watching the fields go by, my eyes fell upon …. a pond. A large expanse of water. Probably the largest pond - at such a tender age - that I had ever seen. What followed was something dear Granny never forgot. 'I want to be in a pond and I'm not in a pond,' I wailed, to the amusement of the other occupants of the compartment. 'I WANT TO BE IN A POND AND I'M NOT IN A POND.' My protestations got louder until it was clear I wasn't going to stop. The amusement soon turned to irritation - then anger. Oh, what happy childhood memories. An American friend of mine who hails from Maine, New England, is amused with the British obsession with winter weather. 'Snow drifts six foot deep, automobiles buried alive.' she says. 'That's how it is at home in winter. But in Britain the first snow fall makes headline news.' She has a point. Several years ago, at a writers' retreat, we were asked to compose the opening paragraph of a contemporary novel. 'And make sure it's not about the weather,' warned the tutor. This, I soon discovered, was very good advice. Nothing, it seems, can be more boring than rain. (or lack of it.) There will always be exceptions to the rule, of course, such as the critically acclaimed opening to Charles Dickens' masterpiece Bleak House (reproduced below.) But that really is the exception. My favourite opening of all remains 'It was a dark and stormy night...' the one my mother read out loud to me on a winter's evening when I couldn't get to sleep. At the risk of showing my age I still love Martha and the Vandellas' 1963 hit Heatwave from the musical As Thousands Cheer, which must be ripe for a revival. And nothing evokes summer days more than the Beach Boys belting out Surfing USA. When my elder daughter was growing up she was obsessed with Australian TV, full of beaches, barbeques and suntanned bodies. The teenage stars did occasionally go to school but most of their spare time was spent on the beach or by the pool. So, is that what we're doing now in Britain? Taking time off and heading for the beach? No, the workforce are carrying on as usual, the men removing their ties, the women taking a lunchtime dip, but none with the aplomb of our European counterparts. So can I suggest we all find a pond. A very large pond. And, throwing caution to the wind, jump in it. Implacable November weather. As much mud in the streets as if the waters had but newly retired from the face of the earth, and it would not be wonderful to meet a Megalosaurus, forty feet long or so, waddling like an elephantine lizard up Holborn Hill. Smoke lowering down from chimney-pots, making a soft black drizzle, with flakes of soot in it as big as full-grown snow-flakes — gone into mourning, one might imagine, for the death of the sun. Nothing makes a journalist happier than too much news and, right now, there's plenty to choose from: the 50th anniversary of equal pay, 100 years since suffragettes got the vote, the brand new Duchess of Sussex stepping out with the Queen in Chester, and the frenzied run-up to the World Cup. I particularly like this photo (above) of the Ford women at Dagenham because back then I was an 18-year-old trainee reporter fighting my own battle for equal rights. Paradoxically I earned as much as the all-male staff reporters but, in their eyes, I was anything but equal. 'Make us a cup of tea love,' was a common refrain in our office at a time when thoroughly modern man had yet to exist. More than once a busy PR man dismissed me with the line 'I'm waiting for the chap from the Gazette.' 'I am the chap from the Gazette' became my mantra. My favourite programme of the time, That Was The Week That Was, showcased a young David Frost and the sassy Millicent Martin, who sang the week's news in satirical fashion like no-one had done before. Now, here's a bit of news you didn't know. I was in Chester last week on the day Meghan (sorry, the Duchess of Sussex) went walkabout with her new best friend the Queen. My other half and I weighed up the possibilities of getting a good view and decided to stay in the sun-drenched apartment we had rented for a few days and watch the whole thing on television. Hurricane Hector wreaked its havoc, the Duchess almost lost her hair extensions, but the show must, and did, go on. Since we're talking about history, that day in June when Meghan and the Monarch became mates, was when the attitude of the monarchy to so-called 'outsiders' changed. If only Princess Margaret had been able to marry the man she loved. Except that he was divorced and the young Queen wouldn't allow it. As Her Majesty chatted to Meghan, like two old friends meeting for a coffee, I couldn't help feeling that our monarch truly regretted the decision that ultimately ruined her sister's life. Which brings me to the Suffragettes. Who could forget Emily Wilding Davison the woman who ran in front of the then King's horse and lost her life for the cause. There are ways and ways of proving women are equal. Maybe, after all, Meghan knows best? Tragedy on Guernsey - the Island of Dreams. One day in the summer of 1943, 42-year -old Edith Emily Brown (nee Ruaux) received a Red Cross message that would change her life forever. Her son had died of meningitis, a very long way from home. Edith and her husband, James, were trapped in the Channel Island of Guernsey, occupied by the Nazis who had already stolen their freedom and requisitioned their home. Three years earlier in June 1940 the couple, my late grandparents, had waved goodbye to David, aged ten, and fourteen-year-old Harold as they took the last boat to Britain, along with hundreds of other schoolchildren evacuated to Britain for their own safety. 'Look after your little brother' were the last words my granny uttered, too overcome to say anything else. That fateful Red Cross message revealed that one of their children had died of meningitis, but tragically gave no name. Edith collapsed in shock, but it was another six months before my grandparents knew that they had lost their younger son. My father, Harold, was billeted in Oldham with distant relatives, unable to share the grief for his 13-year-old brother with his heartbroken mum and dad. When Harold arrived back on the island he was a grown man, an RAF navigator recently married to my mother, an 18-year-old Lancashire girl who worked in the wages department of a local munitions factory. I was one of their three daughters born over the next seven years. My childhood was idyllic, which is why I call Guernsey my Island of Dreams, and I hope that the love given and received helped, in some small way, to ease the pain of the family's loss. Sadly, my family were just some of many Guernsey residents who lost loved ones during the Second World War. More than thirty islander were killed outright when the Germans bombed the tomato lorries on the White Rock (the local name for the quayside) on June 28 1940. Other extraordinarily brave dissenters died in German concentration camps simply for breaking the Occupiers' rules. They, along with David, will never be forgotten. This week Guernsey celebrated the 73rd anniversary of the island's liberation on May 9 1945. The celebrations, as always, held a note of defiance and tinge of sadness for those who never returned. Are you a fan of audiobooks? 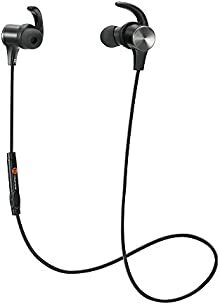 Do you listen to them while you're on the train or at the gym? If so, it seems you've bought into the fastest growing market in the book trade. Sales of audiobooks have doubled in the past five years, according to Nielsen Bookscan figures revealed at the London Book Fair this week. Surprisingly, commuters and men aged twenty-five to fourty-four account for most of that increase. And now I'm joining them! Advised by my optician to reduce the amount of time I spend online, and with an everlasting penchant for e-books and paperbacks, I don't want my reading to suffer. So what better way of relaxing than let someone else do the talking? It's easy to see why the trend is so popular. You can listen on your smartphone, kindle, iPad or tablet and even on your computer. And consider the benefits to people with impaired vision, or those just too tired to read after a long day at work. I am not a fan of audiobooks for children as I prefer bedtime stories read by mum, dad, aunties, friends and babysitters, though they might come in handy on a long car journey. As for the narrators, many of them are experienced actors and actresses, but some authors read their own novels and that's something I would love to do. If you have a favourite audiobook, please let me know in the comments section. If you are an author, please send a link and I'll do my best to include it in my next blog post. Before you leave this blog ( squirming) I deny all responsibility for the above sentence. It was composed by... a computer! Let me explain. Eleven works of robot-assisted fiction were amongst the 1,450 entrants for a Japanese fiction competition recently. The Hoshi Shinichi Literary Award, named after one of Japan's most famous fiction writers, invited 'artificial intelligence programs' to submit their works. Phew - that's a relief! Who says we're angry? We ALL wanted to be extras! A movie set in the German Occupation of Guernsey is coming to our screens in April, leaving many islanders angry that it was filmed in Devon, according to some of this weekend's newspapers. The film version of the Guernsey Literary and Potato Peel Pie Society by Mary Ann Shaffer and Annie Burrows, an international best-selling book when published in 2008, has been long awaited by readers and residents, starring Downtown Abbey actress Lily James. Hitler's Occupation of Saunton Sands said the Mail on Sunday headline adding: Islanders' anger as Lily James wartime drama moves Guernsey to Devon. A street in Bideford became a Nazi-occupied area and a sequence featuring an American Dakota on a beach was shot on nearby Saunton Sands, as well as other Devon locations such as Hartland Abbey. So, are the islanders really angry? As a Guernsey-born author now living in England, I decided to ask. Here is a selection of the replies. The official reason for not filming on the island is that too much has changed there since the Second World War. But help is at hand. I hear that Guernsey Tourist Board are staging a Movie Walk round the island between April 6 and April 20 showing the locations mentioned in the book. From triumphant to tragic - why do we blog?